It took six of us four and a half hours to pack all the chocolates – first putting over 2000 candies into cups, then packing the boxes, then applying stickers, tying bows, and packing them into shipping boxes. Â Quite a production! In previous years I’ve used a plain gold box with a red ribbon (bow in center). Â This year I designed some box art, printed it out on clear labels, and used them on white boxes. Â The result is not only more attractive and better “branded”, it’s also a lot cheaper – white boxes are about 1/4 Â the price of gold ones. Â And – added bonus – the stickers double as closures – they extend over the edge of the boxes to seal it closed. Â All in all, I liked this method, and will use it again. Packing required a certain degree of ingenuity, especially in packing the last few pieces in each layer. Â It was like putting together a jigsaw puzzle – trying to figure out which pieces fit where. Â In the end we had to leave out the dried apricots and (in some boxes) the English toffee; the boxes were stuffed absolutely full and there was simply no space for them. Â Each box weighed approximately 1 full pound, remarkable since last year’s boxes contained only 13 ounces and I would have sworn they were stuffed completely full! Â I suspect some fourth-dimensional twist of magically permitting more candy. And then it was time to sort out the leftovers. Â There were about 24 pounds of leftover chocolates, plus some “chocolate slag” left over after the last dipping. Â My volunteeers must have carted off fifteen or sixteen pounds of chocolates, leaving about four pounds each Â for Mike’s coworkers and mine. Â (Well, and a small stash of jasmine tea caramels, which I love too much to part with completely.) Â They went home, I printed out and applied all the mailing labels, and stacked the “to be shipped” boxes into a giant box. End Chocopalooza 2011! Â Another successful year of candymaking. What now? Â Well, there is at least another day’s worth of cleanup: washing out chocolate molds, putting away the chocolate containers, and picking up bits of ribbon, extra candy cups, etc. Â Tuesday I will probably spend weaving and packing, and then Wednesday it’s off to Maryland! Â We are visiting my family for Thanksgiving, chocolates in tow. Which reminds me – I better prep myself something to do while traveling! Â Perhaps it’s time to pop over to the yarn store (or Â to my stash) for some sock yarn. Â Or maybe I’ll just pack a bunch of weaving books. Â All things in time. 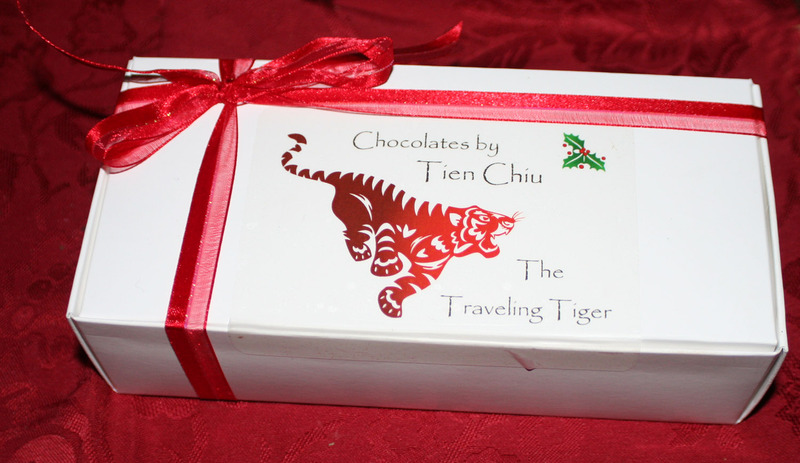 Beautiful box, and such wonderful chocolate stories. Enjoy!!! Fantastic. They look wonderful to go with the great taste. Thanks for sharing this years chocolate journey.